Just as ‘The Grel Escape’ featured the return of an alien menace introduced outside of televised Doctor Who, so, too, does Simon Forward’s ‘The Bone of Contention’ which sees the return of the Galyari aboard the Clutch as first introduced in Big Finish’s 2002 tale ‘The Sandman’ by the same author. These nomadic beings descended from avian-like creatures who live amongst the stars with other races in a shifting collection of spaceships made a grand first impression, and ‘The Bone of Contention’ travels back to a time before their introductory tale when they still fear the dreaded Sandman and are looking for ways to defend themselves, not serving as a direct prequel but nonetheless fleshing out this race even more thoroughly along the way. One recurring thematic undercurrent to these stories since the arrival of Bernice’s son Peter is that she continues to realise just how much she loves him as she- perhaps understandably- continues to refuse to accept a domestic lifestyle in order to continue to explore the universe and its artefacts. While the scripts are wise not to dwell on this too much since there would be no series without Bernice adventuring on her own and since her patchwork family at the Collection provides Peter with a safe enough environment, the pattern that has begun to manifest is nonetheless notable. Still, Bernice’s attempt to retrieve an artefact that the Galyari bought in a deal long ago resulting in her forming an intimate bond with a child of the Galyari who finds himself threatened with death is a dramatic and emotion-fueled path for this character to take that only reinforces how dedicated to her principles and her own child she is even if Bernice does suffer from a few questionable decisions along the way that portray her as a bit less shrewdly intelligent than usual. Sadly, the brief running time of ‘The Bone of Contention’ does not allow the environment and atmosphere of the Clutch to be explored and developed to its fullest extent, but the Galyari as a whole are fairly well treated even if the child Griko whose violent tendencies become the focal point is brought to life as little more than various sound effects. The Star Gypsy Mordecan returns from ‘The Sandman,’ with the script taking time to explain why Robin Bowerman’s version of the character is without his Irish accent, and both Tracey Childs as Director Tseshra and Steffan Rhodri as Commander Korshal do well to imbue profound emotion both to the characters and to the plot as a whole as the roles of hero and villain are called squarely into question. The execution may not be quite as tight as in other tales, and the hysteria that eventually ensues is perhaps a bit off, but the initial setup of the Galyari distorting Greco’s bloodline as they try to force this unique child into an alien race that eventually is revealed to be their attempt to craft the ultimate weapon to deploy against the Sandman is wonderful, and Bernice being the one to ultimately harm the child more as she takes him away but cannot control his evolution is dynamic and riveting. Having Griko as a non-speaking entity who demands so much of the plot’s attention is an interesting choice that the script for the most part pulls off thanks to the strong performances of its small cast, but this setup also means that the innate dramatic potential stemming from Griko’s standpoint must be left unexplored. 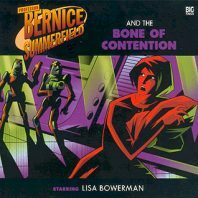 Still, ‘The Bone of Contention’ continues to develop one of Big Finish’s more intriguing inventions in the Galyari and captures the spirit and wonder of Doctor Who expertly while ensuring that Bernice firmly maintains her own tone and style.